Baby bones up on Bates Wilson before flying to Salt Lake for interviews. It’s a time of abundance in this life held by a little log cabin in the woods. Our work world is full (check out Sand Creek Tree Service for a glimpse at the busier side of our life), the garden has peaked, our firewood is nearly in, we have a freezer full of berries and a cupboard full of jam. 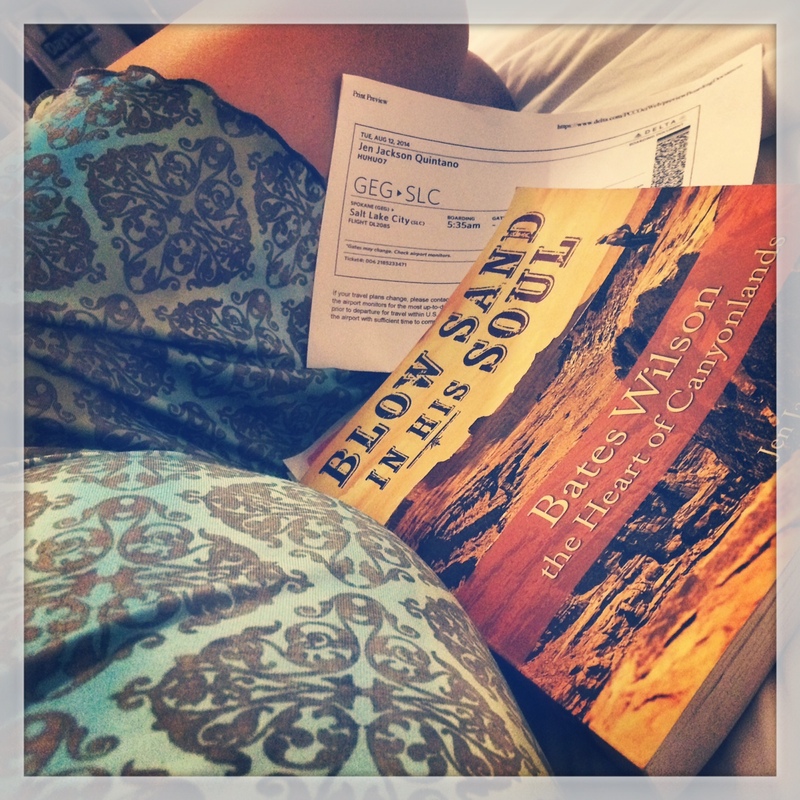 Plus, we’re now embarking on the greatest journey of our lives: parenthood. The little one is due December 12, and by the feel of things, he or she is excited to have more room to flail about come winter. We can’t wait to finally feel the grasp of fingers that for now keep pushing against the barrier of my belly. 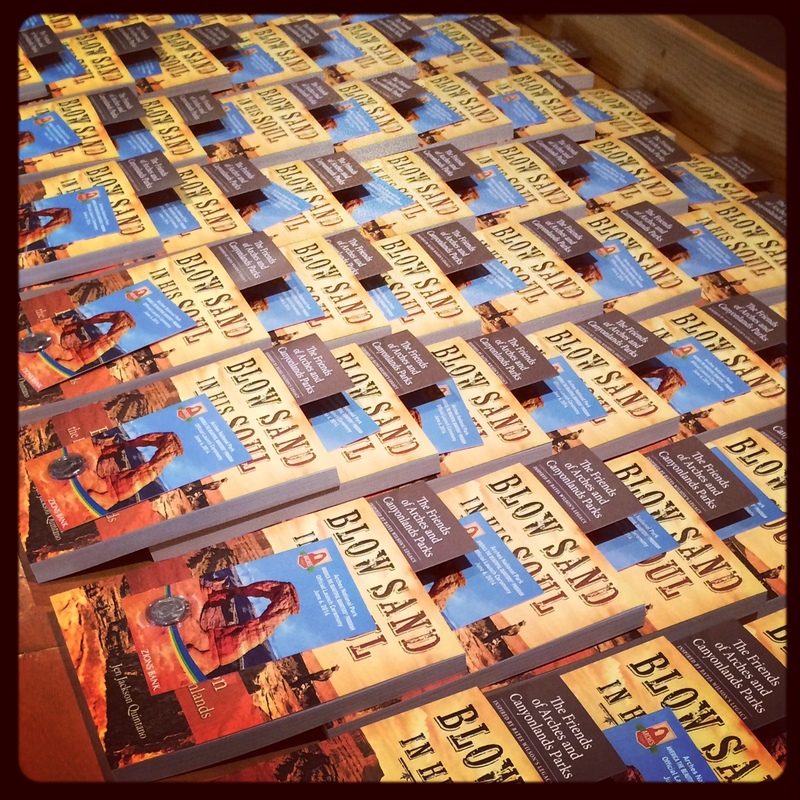 One hundred books signed and ready for the Utah Symphony’s major donors. 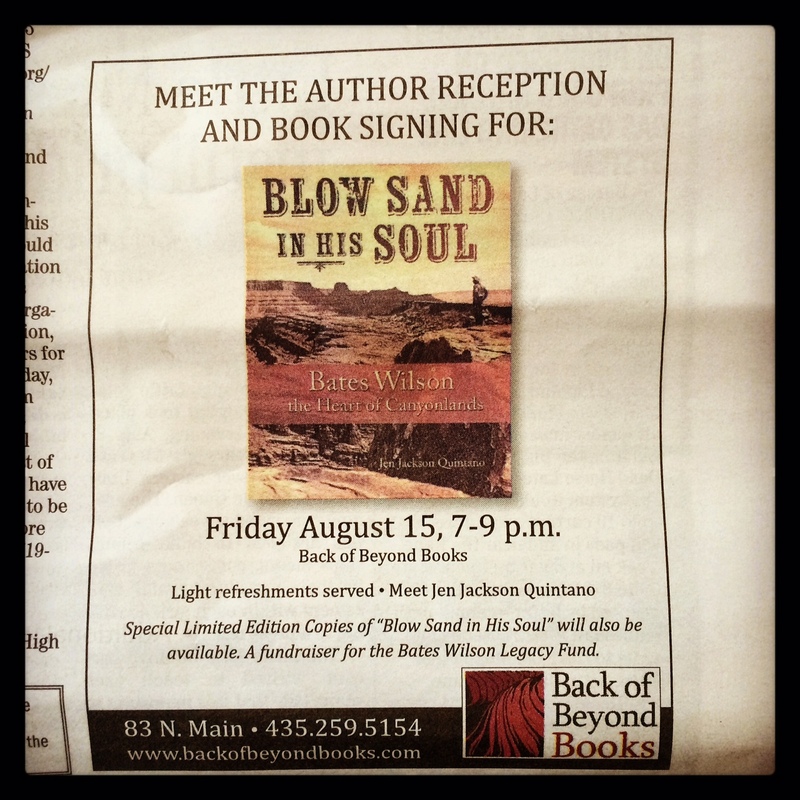 In the midst of all this bounty and wonder, I’m also enjoying my first book tour, this in support of Blow Sand in His Soul: Bates Wilson, the Heart of Canyonlands. August found me in Salt Lake City and Moab, engaging in interviews with radio personalities and newspapers, signing books at the national parks, attending meetings, giving talks and sharing readings. It was a whirlwind and a joy, coming with a sense of affirmation and exhilaration. As I flew out of Moab on my journey home from Round One, my exhaustion was held at bay by an upwelling of gratitude for the place and the community that made this whole thing possible. My world would not be what it is without the people and places of the Colorado Plateau. Signing books at the Island in the Sky Visitors Center. Round Two finds me back in Utah in September to help celebrate Canyonlands National Park’s 50th birthday. The park was signed into being September 12, 1964, thanks in large part to the efforts of Bates Wilson. As a means of honoring the man, the park, and this momentous occasion, I will be offering a reading and discussion at the Grand County Public Library, presenting to area high school classes, signing books and speaking at a Canyonlands film festival event, and giving a talk at the big birthday bash in the Needles (along with renowned author, historian and conservationist Douglas Brinkley). It is another whirlwind in the making. As I sit at my small desk (a repurposed wooden pallet with white pine legs) in the corner of our loft (my old office is now the baby’s room), it is hard to imagine being out in the world in such a public way again. But it will happen, and it will again be a wonder. An ad for Andy’s event at Back of Beyond Books. My thanks to the Friends of Arches and Canyonlands Parks for making this book – and the subsequent tour – possible. Also, gratitude to Andy at Back of Beyond Books for his help every step of the way and for throwing a helluva book party (replete with surprise refreshments). I look forward to eventually introducing our little one to all the people that made my time in the Desert Southwest so special. 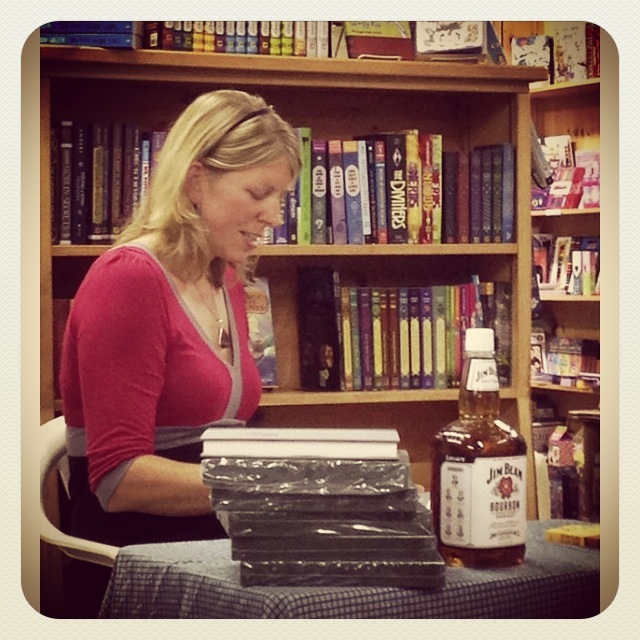 Reading at Back of Beyond Books. There was no doubt about the attendance of Bates’ friend, Mr. Beam. 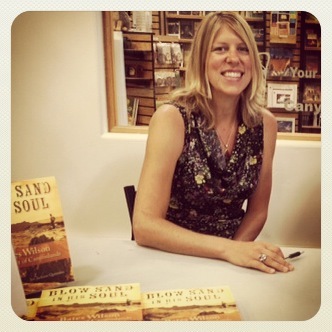 I really enjoyed The book “Blow Sand In His Soul”. I knew Bates well because I was friends with his daughter, Julia, and a member of the same Girl Scout Troup she was in. I still remember well the trip that Bates took us on to Canyonlands well before it became a park. The only criticism I have about the book is there is no mention of S&S Cattle Company which was headquartered at Indian Creek and prosperously ran cattle there for many years. J A Scourp who was in charge of the ranch was my Step-Grandfather and my Father Bill Shupe worked as a cowboy and foreman at Indian Creek for many years. One detail I feel I need to point out is that many of the named formations and areas had already been named well before the time when Bates traveled through Canyonlands because they are the names my grandfather and father knew for them earlier. The cowboys had been using those names for many years. I know that Bates never knew my Father as he died in an truck accident about the time that Bates took over the Arches but he knew my Step Grandfather Scourp since he had been active in the community for many years at the time Bates was starting to get active. Again I really enjoyed the book and Bates was a man I really admired and was glad to have known. I married and moved away from Moab in the sixties so I did not see him often in the later years but I did periodically catcht up with news about him since I stayed in touch with Julia, his daughter. What an exciting time for you! Enjoy every bit of it as you deserve it. Can’t wait to hear all about it and sharing the night with Douglas Brinkley…very neat. I enjoyed the book very much as well as your other stories. 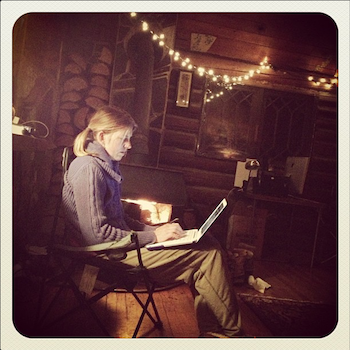 Your way of writing is well, comfortable – very readable. Sit with tea, curl up and enjoy!